to this. It looks great! 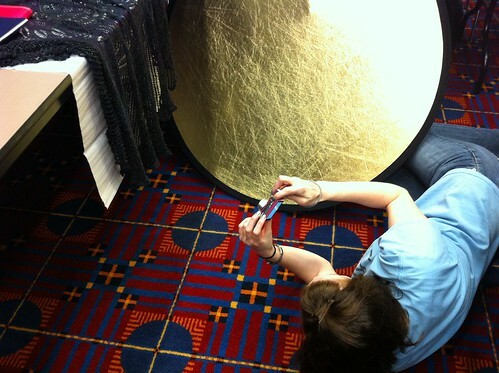 Using a reflector was even better for the beads. 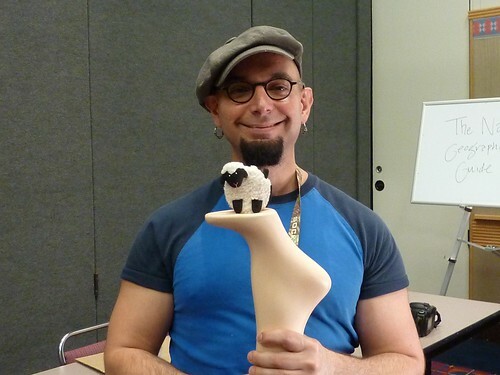 I asked Franklin if he’d pose with my sheep, Lady Baa-Baa. He was quite obliging, although a bit bemused. I saw Franklin later after the opening night reception, and gave him Lady Baa-Baa. I thought he deserved it for putting up with strange requests! The market was open for students for a short time after class. There was quite a line waiting to get in. But everyone eventually made it in the door, and it was really fun. 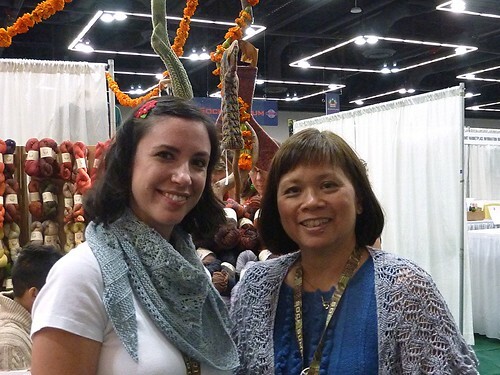 I ran into blogger friend Sonia (Peaceful Knitter). 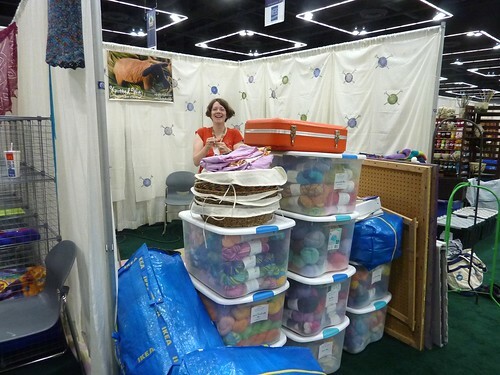 She’s going to be opening a yarn store in Corvallis this fall, called Stash. 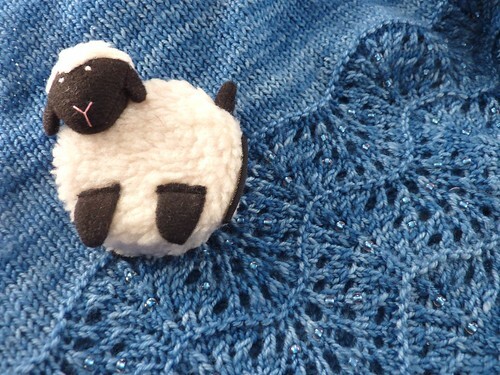 She’s planning to feature local yarn, designers, accessories and artwork. I think I’ll need to make a road trip down there. I saw Leila at Jenkins Woodworking. 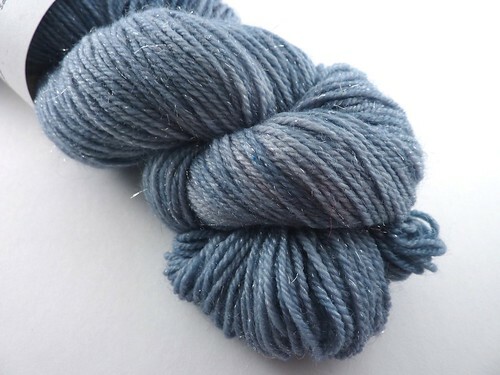 She’s the spinner that hooked me into spinning at the last Sock Summit. 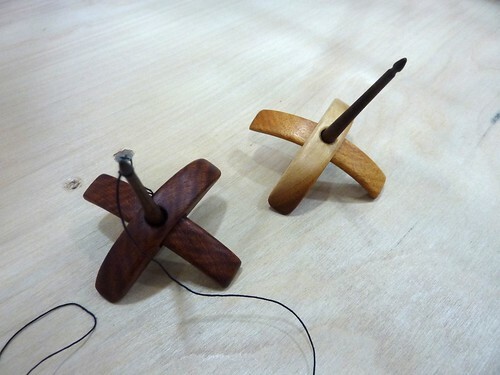 Leila thought I needed another Turkish spindle. Maybe the tiny Kuchulu. I told Sonia that I’d get one if she did, figuring I was safe since she doesn’t spin yet. She was delighted by the Kuchulu, and bough one, so that meant that I had to buy one, too. Mutual peer pressure! I was sunk when she told me that it looked like a little Eiffel Tower, my favorite icon. That’s mine on the left; Sonia’s is on the right. 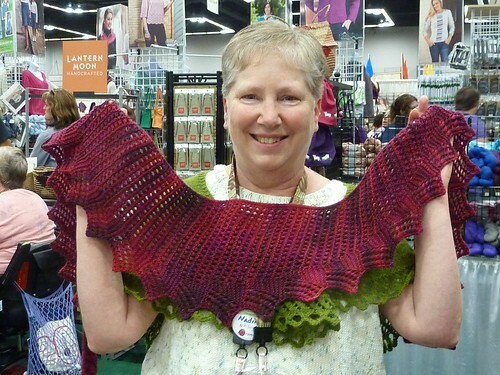 Nadine stopped by the Knitted Wit booth with her Stars and Stripes shawl. The day ended with the opening day reception. Stephanie and Tina regaled us with stories about how Sock Summit and Sock Summit 2 came to be. There was some flash mob practice (not for me, though!). 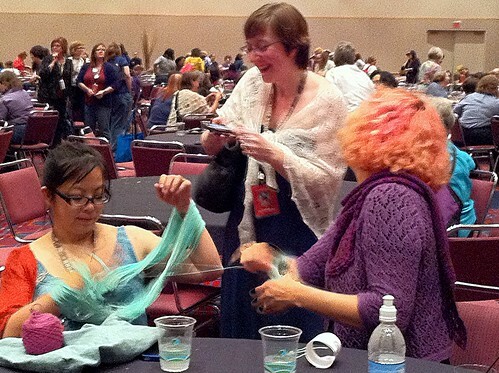 And lots of showing off of fiber, and playing with new acquisitions. That was Thursday. I know I’m a day behind, but I have to sleep now! I’ll catch you up soon. 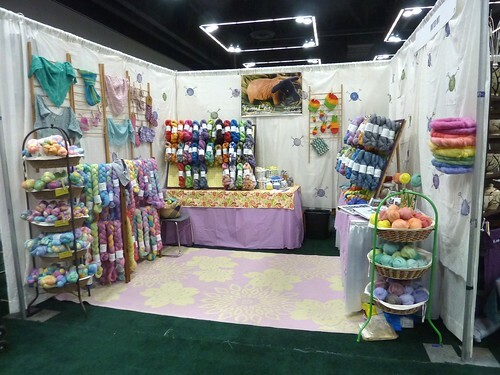 I’m having a meet-up at Knitted Wit’s booth (#725) from noon to 1 p.m. on Saturday. 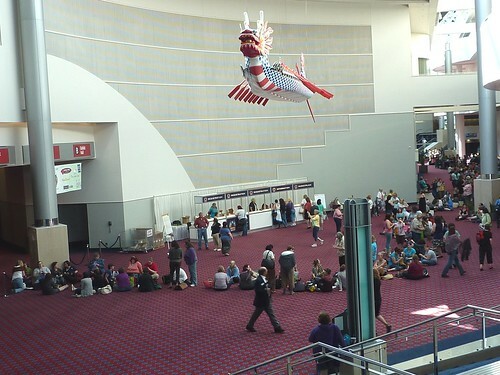 We’re having a Zen Rain photo op at 12:30. Hope to see you! 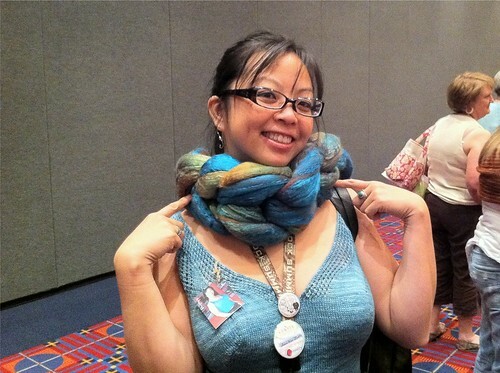 This entry was posted in Knit and tagged photography, sock summit. Bookmark the permalink. What fun! I’m so jealous! And, looks like you are having a fabulous time! Having a great time…will catch up on blogging soon! oh i was hoping for a picture of you and Sonia together! Lovely! I love my Jenkins Turkish spindle! It’s currently in hibernation, but that will have to change. 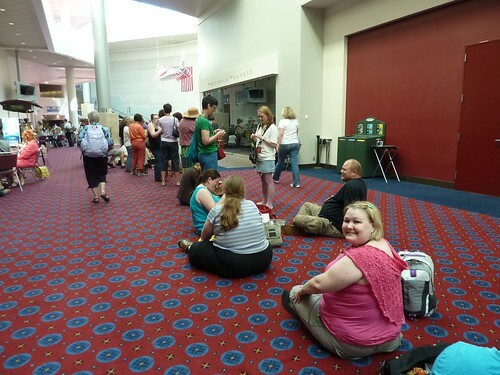 Oy, that line to get into the marketplace is huge. 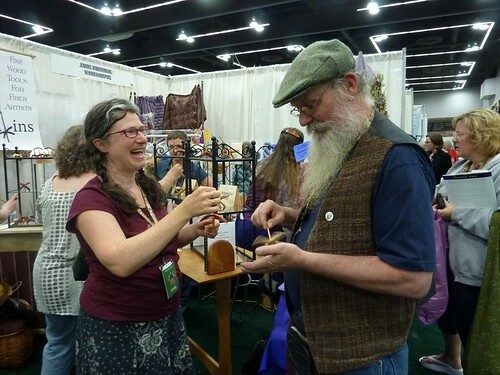 No wonder there were no wooden yarn bowls left on Saturday. I’m catching up on blogs for the first time in ages, so I’m just now seeing your Sock Summit recap. Thanks for sharing in such wonderful detail! I’ve loved hearing about it and seeing your photos!